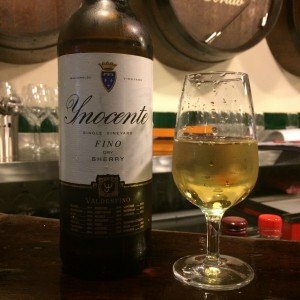 Dia San Andrés (St Andrew’s Day) is not just a special day for Scotland, but for Sherry too. For San Andrés is when the first of the new vintage wine is introduced to the solera–criadera system, used for blending and aging Fino and Manzanilla Sherry wines. It’s a day of celebration to wish the wine well as it starts on its years-long journey, before finally reaching the solera for bottling. 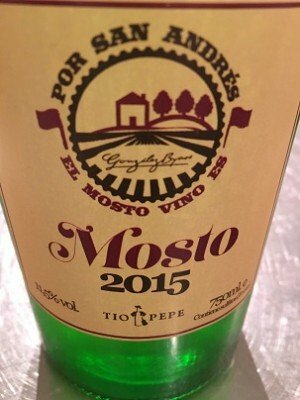 I felt truly privileged to be connected to the DO Jerez terroir as a guest of Gonzalez Byass, sipping their 2015 Mosto (must – unfiltered grape juice) in the vineyard of La Canariera, overlooking the very same vines where the palomino grapes were picked to make this golden nectar. The ‘picnic’ was organised by this venerable bodega to celebrate such a hugely important day in the Sherry calendar – the new season’s mosto meets its family, in this case Tio Pepe, as it sets off on the first stage of its voyage to meet its mother (the solera), to then be bottled. This journey will take five years, ending in a bottle of Tio Pepe. And if not bottled as a Fino, it will head off into another solera and criadera for further ageing as an AB Amontillado. 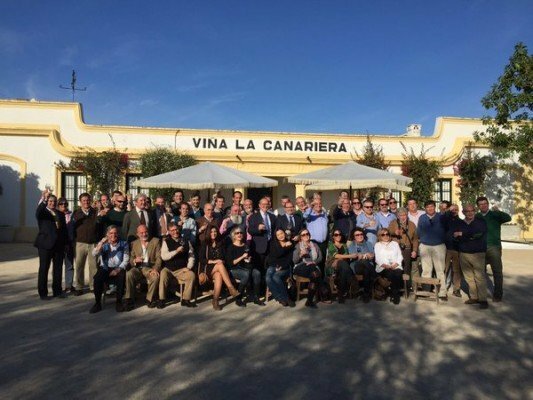 Under the shade of canvas umbrellas in the unusually intense December sunshine, warming the chalky white earth, the checked tablecloths were strewn with wild flowers and bowls of crunchy green olives, jamón, caña and queso. We feasted on sardinas ahumados (smoked sardines), arenque en vinagre (herring in vinegar), chistorra (spicy sausage), and ajo caliente (hot garlic soup) with a tang of fresh mint. All these typical dishes for vineyards workers were accompanied by copious copas of ice-cold super fresh and fragrant Mosto 2015. It was as fresh as anything I’ve ever tasted, slightly sparkling, and at the bottom of each bottle, a little cloudy due to non-filtration. Nothing has changed for years with this wine and food pairing. A time warp (in a good way); a never-ending tradition. The crowd came to a standstill as Gonzalez Byass Master Winemaker Antonio Flores spoke poetically about the glory of this very Mosto. Indeed it’s the DO Jerez winning Mosto of 2015. As Antonio took to the floor, the waiters stopped pouring. Even the chefs dropped their cooking tools and came out of the kitchen to listen to this magical blender almost bless the Mosto. Addressing it like the revered haggis, as it seemed to this Scottish Sherry lover. But the feast didn’t end there, and we were ushered into the main building of La Canariera to dine on a plate of berza, served on the elegant Gonzalez Byass china. A berza is a typical Jerez stew featuring pork, chorizo, morcilla, paprika, onions, garlic, chickpeas and white beans. Leonor Palo Cortado and AB Amontillado were on offer to accompany. I opted for Amontillado – the crisp acidity of which cut through the richness of the delicious broth. It was almost 5pm when the polvorones and pestiños (traditional sweet pastries) were brought out, washed down with PX Nectar from Gonzalez Byass and coffee. To make a great day of fun and merriment even better, upon departure we were all given a party bag containing a bottle of Tio Pepe Mosto 2014! Drinking Sherry is always a pleasure, wherever you are. But sampling the latest vintage, while enjoying a view of the very vines which produced it just a few weeks ago, on a sunny winter’s day, was a truly memorable experience. Fond of a drop of Sherry? Check out my pick of favourite cocktails.